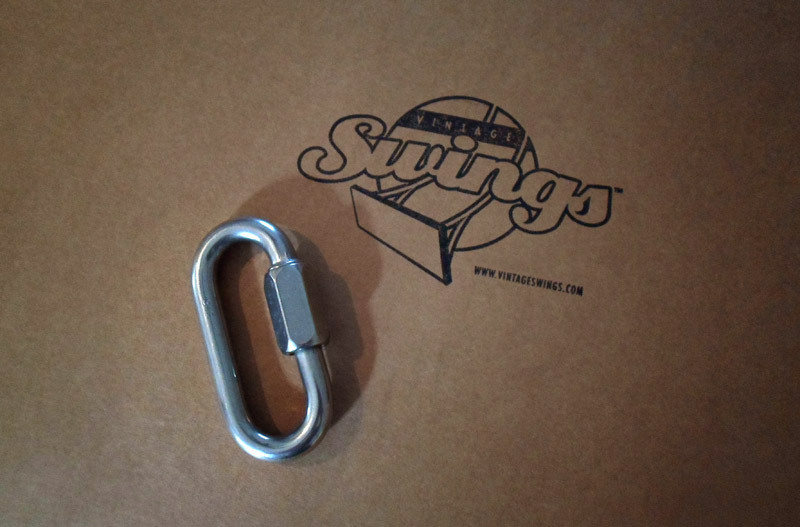 Granted, you may be able to find your standard zinc plated or galvanized hanging hardware at your local hardware store, but Vintage Swings has hunted high and low to bring you the absolute best: stainless steel. 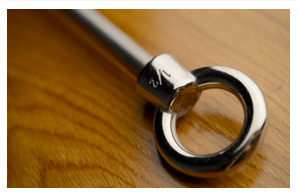 Pretty: As most know, stainless steel doesn't rust. Your hardware will last as long as—and look as beautiful as—your swing for many years to come. Safest for you: Stainless steel offers a higher load rating than standard galvanized steel of the same size. Safest for your tree: But perhaps most important of all... stainless steel, when mounted through a living tree branch, will be the best for the tree. Stainless steel will not corrode and cause infections inside the tree. So if you love your tree, as we do, please consider stainless steel the only option. Don't forget to read our HANG page of the website to learn how to hang your new swing correctly, safely. 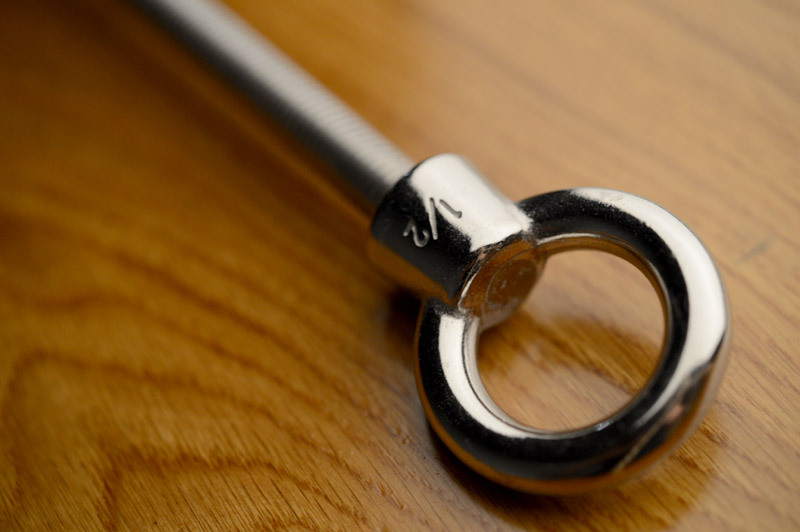 Our eye bolts are 1/2'' Stainless Steel threaded rod TIG welded to a 1/2'' Stainless Steel lifting eye. Each Tree branch hanger is supplied with the appropriate nut and washer and will work on branches up to 11.5'' in diameter. Please contact us directly if you need longer rods. Sold each. So if you buy a single swing, you'll need 2 and for a double swing you'll need 3. 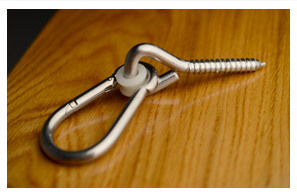 Attach a heavy duty quick link between the tree hanger and your rope for ease of future removal. 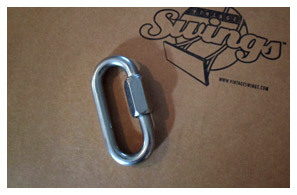 Quick links are made of stainless steel and are load rated for 3900#s each. 3/8" diameter • 3.5"x1.75"
These stainless steel hangers make screwing into porch ceiling beams and other dimensional lumber a snap. 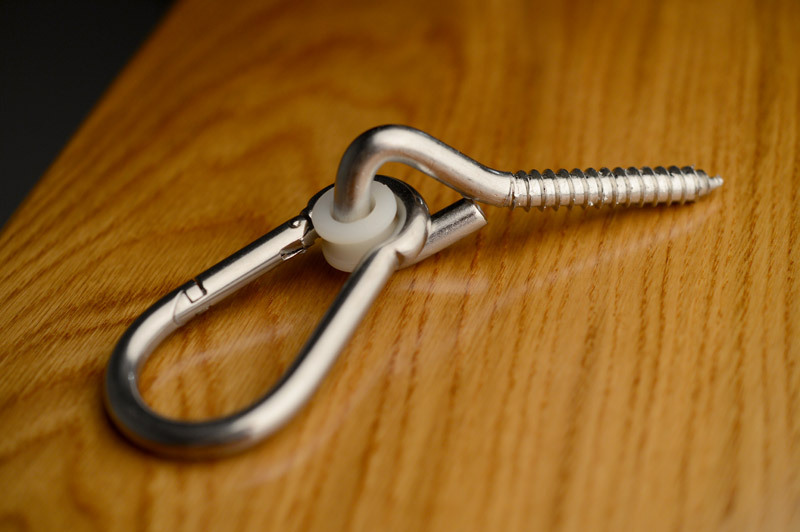 The clip conveniently opens for easy seasonal swing removal. The plastic bushing is a nice feature which does away with any swinging associated squeaks.